HEADHUNTER Reimagined is an all-new telling of Michael Slade’s first Special X thriller (published in 1984) about the psycho-hunters of the Royal Canadian Mounted Police. The Headhunter is loose on the streets of Vancouver. The psycho’s victims are everywhere - floating in the Fraser River, buried in a shallow grave, nailed to a totem pole on the university campus. All are women. All are headless. Then the taunting photographs arrive. Carefully posed shots of the women’s heads stuck on poles. The Mounties of Special X are up against a unique brand of killer. A killer whose sexual psychosis stretches back through Ecuador’s steaming jungle and a scream-filled New Orleans dungeon to a dead-of-winter manhunt in the Rocky Mountains a century ago. Criminal lawyer Michael Slade has acted in over a hundred murder cases. He specializes in the law of insanity, and argued the last hanging case in the Supreme Court. 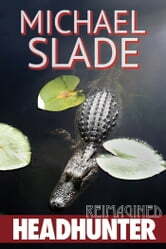 Reader’s Digest says: "The Slade books have developed a strong following among police officers because of their strict adherence to proper police procedure." Slade was guest speaker at the international Police Leadership Conference and at several RCMP regimental dinners, and was guest of honor at the World Horror Convention in Seattle.